In Microsoft Access, macros that are attached to user interface (UI) objects such as command buttons, text boxes, forms, and reports are known as UI macros. This distinguishes them from data macros, which are attached to tables. You use (UI) macros to automate a series of actions, such as opening another object, applying a filter, starting an export operation, and many other tasks. This article introduces you to the newly-redesigned macro builder, and shows you the basic tasks involved in creating a UI macro. Note: This article doesn’t apply to Access web apps. 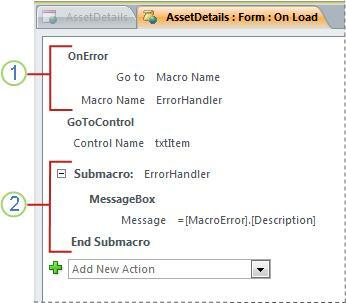 Macros can be contained in macro objects (sometimes called standalone macros), or they can be embedded into the event properties of forms, reports, or controls. Embedded macros become part of the object or control in which they are embedded. Macro objects are visible in the Navigation Pane, under Macros; embedded macros are not. Each macro is made up of one or more macro actions. Depending on the context you are working in, some macro actions may not be available for use. Here are some of the main feature highlights of the Macro Builder. Action Catalog Macro actions are organized by type and searchable. IntelliSense When typing expressions, IntelliSense suggests possible values and lets you select the correct one. Keyboard shortcuts Use key combinations for faster, easier macro writing. Program flow Create more readable macros with comment lines and groups of actions. Conditional statements Allow for more complex logic execution with support for nested If/Else/Else If. Macro reuse The Action Catalog displays other macros you have created, letting you copy them into the one you’re working on. Easier sharing Copy a macro, then paste it as XML into an email, newsgroup post, blog, or code sample web site. Here's a video that walks you through the main areas of the Macro Builder. This procedure creates a standalone macro object that will appear under Macros in the Navigation Pane. Standalone macros are useful when you want to reuse the macro in many places of the application. By calling the macro from other macros, you can avoid duplicating the same code in multiple places. Access opens the Macro Builder. On the Quick Access Toolbar, click Save. In the Save As dialog box, type a name for the macro, and then click OK.
Continue with the section Add actions to a macro. This procedure creates a macro that is embedded in an event property of an object. Such a macro does not appear in the Navigation Pane, but can be called from events such as On Load or On Click. Because the macro becomes part of the form or report object, embedded macros are recommended for automating tasks that are specific to a particular form or report. In the Navigation Pane, right-click the form or report that will contain the macro, and then click Layout View. If the property sheet is not already displayed, press F4 to display it. Click the control or section that contains the event property in which you want to embed the macro. You can also select the control or section (or the entire form or report) by using the drop-down list under Selection Type at the top of the property sheet. In the Property Sheet task pane, click the Event tab. Click in the property box for the event you want to trigger the macro. For example, for a command button, if you want the macro to run when the button is clicked, click in the On Click property box. If the property box contains the words [Embedded Macro], this means a macro has already been created for this event. You can edit the macro by continuing with the remaining steps in this procedure. If the property box contains the words [Event Procedure], this means that a Visual Basic for Applications (VBA) procedure has already been created for this event. Before you can embed a macro in the event, you will need to remove the procedure. You can do this by deleting the words [Event Procedure], but you should first examine the event procedure to make sure that removing it will not break needed functionality in the database. In some cases, you can recreate the functionality of the VBA procedure by using an embedded macro. Click the Build button . If the Choose Builder dialog box appears, make sure Macro Builder is selected, and then click OK.
Access opens the Macro Builder. Continue with the next section to add actions to the macro. Actions are the individual commands that make up a macro, and each is named according to what it does, for example, FindRecord or CloseDatabase. The first step in adding an action is finding it in the Add New Action drop-down list or in the Action Catalog. If the Action Catalog is not displayed, on the Design tab, in the Show/Hide group, click Action Catalog. Click the arrow in the Add New Action drop-down list, and scroll down to find the action. Program flow elements are listed first, and then the macro actions are listed alphabetically. Browse for the action in the Action Catalog pane. The actions are grouped by category. Expand each category to view the actions. If you select an action, a short description of the action appears at the bottom of the Action Catalog. Search for the action in the Action Catalog pane by typing in the Search box at the top of the pane. As you type, the list of actions is filtered to show all macros that contain that text. Access searches both the macro names and their descriptions for the text you enter. Select an action in the Add New Action list, or just begin typing the action name in the box. Access adds the action at the point where the Add New Action list was displayed. Drag the action from the Action Catalog to the macro pane. An insertion bar appears to show you where the action will be inserted when you release the mouse button. Double-click the action in the Action Catalog. If an action is selected in the macro pane, Access adds the new action just below the selected one. If a Group, If, Else If, Else, or Submacro block is selected in the macro pane, Access adds the new action to that block. If no action or block is selected in the macro pane, Access adds the new action to the end of the macro. If you have already created one or more macros, they are listed under the In this Database node in the Action Catalog. Dragging a standalone macro (one that is listed under Macros) into the macro pane creates a RunMacro action that runs the macro you dragged in. You can then use the drop-down list to call submacros, if present. If you just want to copy the actions from a standalone macro into the current macro (instead of creating a RunMacro action), right-click it in the Action Catalog, and then click Add Copy of Macro. Dragging an embedded macro (one that is listed under a form or report object) into the macro pane copies the actions from that macro into the current macro. You can also create an action by dragging a database object from the Navigation Pane to the macro pane. If you drag a table, query, form, report, or module to the macro pane, Access adds an action that opens the table, query, form, or report. If you drag another macro into the macro pane, Access adds an action that runs the macro. When you see a value that you want to use, add it to your expression by double-clicking it or using the arrow keys to highlight it and then pressing the TAB or ENTER key. For more information about creating expressions, see the article Introduction to expressions. When you are creating an embedded UI macro on a web-compatible form, IntelliSense allows you to add any form property to an expression. However, in a web database, only a subset of form properties can be accessed by using UI macros. 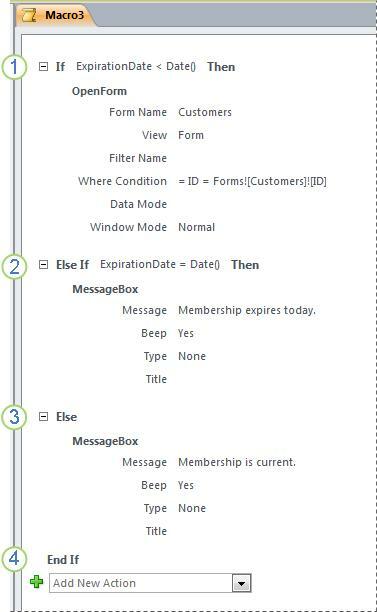 For example, given a control named Control1 on a form named Form1, IntelliSense will let you add [Forms]![Form1]![Control1]. [ControlSource] to an expression in a UI macro. However, if you then publish the database to Access Services, the macro containing that expression will generate an error when it is run on the server. Drag the action up or down to where you want it. Select the action, and then press CTRL + UP ARROW or CTRL + DOWN ARROW. Select the action, and then click the Move Up or Move Down arrow on the right side of the macro pane. Select the action, and then press the DELETE key. Alternatively, you can click the Delete (X) button on the right side of the macro pane. If you delete a block of actions, such as an If block or a Group block, all the actions in the block are deleted as well. The Move up, Move down, and Delete commands are also available on the shortcut menu that appears when you right-click a macro action. To execute macro actions only when certain conditions are true, you use an If block. This replaces the Condition column that was used in earlier versions of Access. You can extend an If block with Else If and Else blocks, similar to other sequential programming languages like VBA. The If block executes if the ExpirationDate field is less than the current date. The Else If block executes if the ExpirationDate field is equal to the current date. The Else block executes if none of the previous blocks do. The If block ends here. Select If from the Add New Action drop-down list, or drag it from the Action Catalog pane to the macro pane. In the box at the top of the If block, type an expression that determines when the block will be executed. The expression must be Boolean (that is, one that evaluates to either Yes or No). Add actions to the If block by selecting them from the Add New Action drop-down list that appears within the block, or by dragging them from the Action Catalog pane to the If block. Select the If block , and then on the lower right corner of the block, click Add Else or Add Else If. If you are adding an Else If block, type an expression that determines when the block will be executed. The expression must be Boolean (that is, one that evaluates to either True or False). Add actions to the Else If or Else block by selecting them from the Add New Action drop-down list that appears within the block, or by dragging them from the Action Catalog pane to the block. The commands to add If, Else If, and Else blocks are available on the shortcut menu that appears when you right-click a macro action. If blocks can be nested up to 10 levels deep. Each macro can contain multiple submacros. A submacro is designed be called by name from the RunMacro or OnError macro actions. You add a Submacro block to a macro in the same way that you a macro action, as described in the section Add actions to a macro. Once you have added a Submacro block, you can drag macro actions into it, or select actions from the Add New Action list that appears within the block. You can also create a Submacro block by selecting one or more actions, right-clicking them, and then selecting Make Submacro Block. Submacros must always be the last blocks in a macro; you cannot add any actions (except more submacros) below a submacro. If you run a macro that only contains submacros without specifically naming the submacro you want, only the first submacro will run. You can improve the readability of a macro by grouping actions together and assigning a meaningful name to the group. For example, you could group actions that open and filter a form into a group named “Open and filter form.” This makes it easier to see which actions are related to each other. A Group block does not affect how the actions are executed, and the group cannot be called or run individually. Its primary use is for labeling a group of actions to help you understand the macro as you read it. In addition, while editing a large macro, you can collapse each group block down to a single line, reducing the amount of scrolling you have to do. Select the actions that you want to group. Right-click the selected actions, and then click Make Group Block. In the box at the top of the Group block, type a name for the group. Drag the Group block from the Action Catalog to the macro pane. Drag macro actions from the Action Catalog into the Group block, or select actions from the Add New Action list that appears within the block. Group blocks can contain other Group blocks, and can be nested up to a maximum of 9 levels deep. When you create a new macro, the macro builder displays macro actions with all arguments visible. Depending on the size of the macro, you might want to collapse some or all of the macro actions (and blocks of actions) while you are editing the macro. This makes it easier to get an overall view of the structure of your macro. You can expand some or all of the actions as needed to edit them. Click the plus (+) or minus (-) sign to the left of the macro or block name. Alternatively, press the UP ARROW and DOWN ARROW keys to select an action or block, and then press the LEFT ARROW or RIGHT ARROW keys to collapse or expand it. On the Design tab, in the Collapse/Expand group, click Expand Actions or Collapse Actions. On the Design tab, in the Collapse/Expand group, click Expand All or Collapse All. Tip: You can “peek” inside a collapsed action by moving the pointer over the action. Access displays the action arguments in a tooltip. If you need to repeat actions that you have already added to a macro, you can copy and paste the existing actions much as you would do with paragraphs of text in a word processor. When you paste actions, they are inserted just below the currently selected action. If a block is selected, the actions are pasted inside the block. Tip: To quickly duplicate selected actions, hold down the CTRL key and drag the action(s) to the location in the macro where you want them to be copied. When you copy macro actions to the clipboard, they can be pasted as Extensible Markup Language (XML) into any application that accepts text. This enables you to send a macro to a colleague via an e-mail message, or post the macro on a discussion forum, blog, or other Web site. The recipient can then copy the XML and paste it into their Access 2010 Macro Builder. The macro is recreated just as you wrote it. Double-click the macro in the Navigation Pane. Call the macro by using the RunMacro or OnError macro action. Enter the macro name in an Event property of an object. The macro will run when that event is triggered. If you are having problems getting a macro to run, there are a couple of tools you can use to get to the source of the problem. We recommend adding error handling actions to each macro as you write it, and leaving them in the macro permanently. When you use this method, Access displays descriptions of errors as they occur. The error descriptions help you understand the error so that you can correct the problem more quickly. Open the macro in Design view. At the bottom of the macro, select Submacro from the Add New Action drop-down list. In the box just to the right of the word Submacro, type a name for the submacro, such as ErrorHandler. From the Add New Action drop-down list that appears within the Submacro block, select the MessageBox macro action. At the bottom of the macro, select OnError from the Add New Action drop-down list. Set the Go to argument to Macro Name. In the Macro Name box, type the name of your error-handling submacro (in this example, ErrorHandler). Drag the OnError macro action to the very top of the macro. The following illustration shows a macro with the OnError action and a Submacro that is named ErrorHandler. The OnError macro action is placed at the top of the macro, and calls the ErrorHandler submacro in the event of an error. The ErrorHandler submacro only runs if it is called by the OnError action, and displays a message box that describes the error. Single Step is a macro debugging mode that you can use to execute a macro one action at a time. After each action is performed, a dialog box appears that displays information about the action, and any error codes that occurred as a result. However, because there is no description of the error in the Macro Single Step dialog box, we recommend using the error-handling submacro method described in the previous section. On the Design tab, in the Tools group, click Single Step. Save and close the macro. To see information about the next action in the macro, press Step. To stop any macros that are currently running, click Stop All Macros. Single Step mode will still be in effect the next time you run a macro. To exit Single Step mode and continue running the macro, click Continue. If you press Step after the last action in a macro, Single Step mode will still be in effect the next time you run a macro. To enter Single Step mode while a macro is running, press CTRL+BREAK. To enter Single Step mode at a specific point in a macro, add the SingleStep macro action at that point. Single Step mode is not available in a Web database. Macros provide a subset of the commands that are available in the Visual Basic for Applications (VBA) programming language. If you decide you need more functionality than macros can provide, you can easily convert a standalone macro object to VBA code, and then make use of the expanded feature set that VBA provides. Keep in mind, however, that VBA code will not run in a browser; any VBA code that you add to a Web database will only run when the database is open in Access. Note: You cannot convert embedded macros to VBA code. In the Navigation Pane, right-click the macro object and then click Design view. On the Design tab, in the Tools group, click Convert Macros to Visual Basic. In the Convert macro dialog box, specify whether you want error handling code and comments added to the VBA module, and then click Convert. Access confirms that the macro was converted, and opens the Visual Basic Editor. Double-click the Converted Macro in the Project pane to view and edit the module.